Within Teamwork Projects, the Calendar is an area that lets you add and view events for your site, your company or your projects. The calendar is accessible via the Calendar tab at the top of your site. You will also have the option to view your milestones, and a preview of any tasks due on each particular day. In the top left of the calendar, you can use the arrows to navigate between months. Alternatively, click the dropdown arrow to view the months. You can add a new calendar event by clicking the Add Event button in the top right. The Options (three dots) button here gives you some export options, as well as editing of event types. 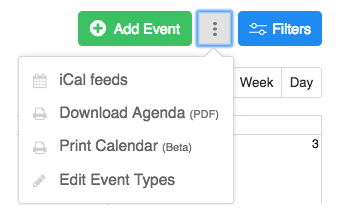 Other options available include an iCal feed that you can use to subscribe to your calendar to an external calendar (like Google Calendar or Outlook), adding reminders to events and creating specific event types for events.